I’m not exactly a huge fan of spicy food. In face, I have a very low tolerance for such things, much to the chagrin of the Fella. He can have gallons of hot sauce, all of the spicy pepper flakes, buffalo chicken to his face and be happy as a clam. I try a tiny bit of hot sauce on something and need 3 glasses of milk. So part of my goals for the summer, aside from not getting sunburned and no ticks please, is to up my spicy food intake by playing with some recipes. 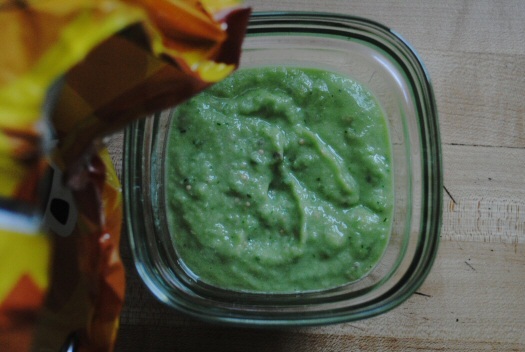 It’s easy to start off with salsa, since all you have to do is put all the ingredients in a blender. 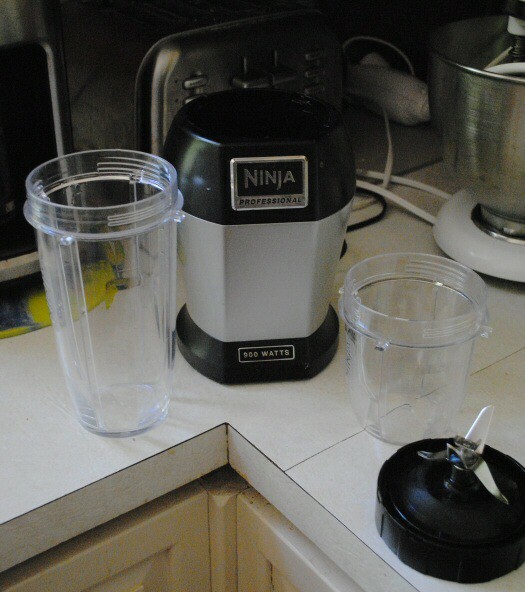 My brother and I bought a really sick one at the end of last summer, so this recipe literally took me about 5 minutes. Ninja! Very worth it! 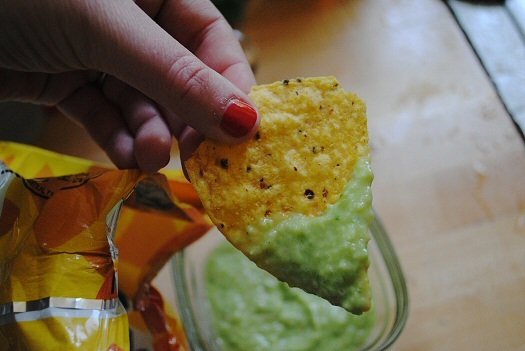 I found this recipe for “Guacamole Salsa“, but I like calling it Green Salsa because it’s not the same texture, consistancy, or taste as guacamole. 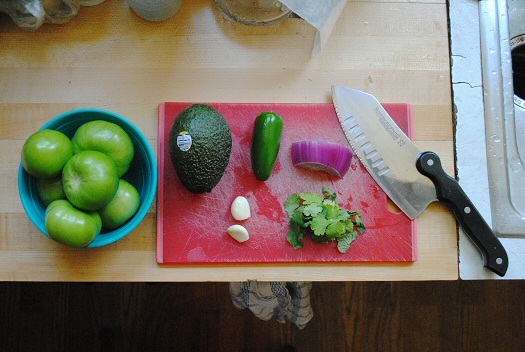 Plus, I like using the Chipotle recipe for guacamole. It’s delicious. This recipe calls for tomatillos (AKA tomate verde) instead of tomatoes, which I’m fine with because I don’t like tomatoes. The tomatillo is meatier, and has an almost citrus flavor. It tastes fresh, and works really well with the avocado. I added the cumin and an extra clove of garlic because, garlic, and put everything in the blender. I took the advice of the original recipe, remembering the put the avocado in “last” (first, since my blender gets turned upside down to blend everything) and the tomatillos in “first”. I had to pack in the tomatillos a few at a time because I don’t have the biggest blender, but once everything started getting liquefied I fit all of the ingredients in no problem. This stuff is not super spicy, but you can add more spice, or maybe more avocado if you want thicker texture. It tastes fresh, with a little kick to it, and the texture is thick enough that you can get a good amount on the chip without dripping some on your shirt. That’s a win in my book! Plus, the color is awesome! These photos are of a small bowl I had for myself, but there’s a big container of it in my fridge right now waiting to be demolished by the rest of the family. Being single can be like being on vacation. For instance, you can create rules and boundaries in your life and only have to answer to yourself. Better yet, you can change or break the rules however you like. If you decide that you don’t drink on week nights but have a particularly awful day on Tuesday and want to shotgun a glass of wine as soon as you get home, you can do it and call it a freebie. The only person who has to deal with your behavior is you. You can be utterly selfish. This even extends to relationships in certain phases, because until there’s a ring on it there’s still that room in your life to say “that’s where I do what I do and you don’t have a say in it”. You get to say no to plans because you want a pedicure. You get to dole out your time with friends like a miser or lavish attention in unexpected ways. You can put all of your time and money into your favorite hobby, be it learning how to basket weave, playing a certain game, or constructing life size clay creatures from fantasy novels. You get to have your thing that makes you happy and no one gets to take that away from you. You can have weird rituals. You can spend two hours perfecting your makeup. You can wake up later and skip the shower. If you’re a slob that keeps piles of clothes instead of a hamper you have a completely organized floor. If you can’t go to bed without having cleaned the house with everything in it’s place you can call it a perfectly normal night. When you’re single you can do things like treat yourself to an adventure, be it driving across a few states to see a friend or taking yourself to the movies. It’s a little scary, but it’s exhilarating to experience something all by yourself. You can focus on the parts of a movie that speak to you, or the joys of a long drive that make you feel more like yourself. One thing that I sometimes miss about being single is being able to romanticize what a relationship would be like. I think we all have done it, looking forward to that magical moment when your eyes meet across the room, the butterflies will be fluttering in your tummy as that person starts talking to you, and you find yourself swept off your feet with the initial request to spend time together. I used to imagine beautiful dates planned and sweet conversations with compliments about parts of me that I didn’t know could be seen as beautiful to another human being. Of course, it is usually based on the romantic things I’ve seen in movies, TV shows, and heard in love songs. One of the reasons I actually love the movie “They Came Together” (which my boyfriend calls one of the worst movies he’s ever been forced to watch, right up there with the time I made him watch “Pride and Prejudice”) is that it mocks the entire romantic comedy genre in the best way ever. It gives the characters the qualities and story lines that we see in every Rom-Com, making the entire movie a mockery of what Hollywood has sugar coated and force fed us since we were in the uterus. Now that I’m on the other side, in a relationship, I occasionally fantasize about the romantic ideas like I used to, but I don’t get too far into them. I’m happy with the Fella that I have, and dreaming about what he could be like if he changed feels wrong. I know what kind of person he is and what kind of person I am. Of course, as a woman, I want to be romanced and wooed and pursued. But it doesn’t all come about in the same ways. Our romantic moments are usually surrounded by goofy moments, loud moments, nerdy moments, serious moments, angry moments, stupid moments, stinky moments, and more. I wouldn’t trade the reality of talking with our mouths full about what the correct answer is in “Who Wants to be a Millionaire” for the daydream of what Hollywood deems romantic. Having three days off in a row can be really annoying. Having three days off in a row when you’re sick and lost your voice, on the other hand, is a blessing in disguise. I sound ridiculous and feel run down, absolutely exhausted and sick. 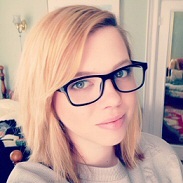 Thankfully, today I managed to get myself together enough to put together a post! 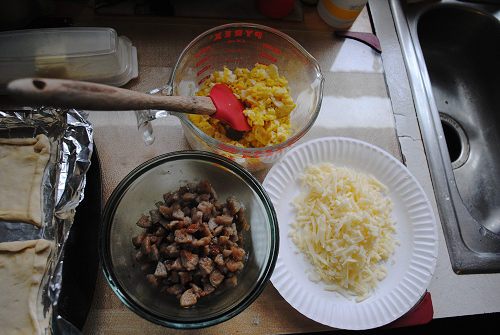 A few table spoons of butter for the frying of the eggs and sausage, and some salt and pepper to taste. 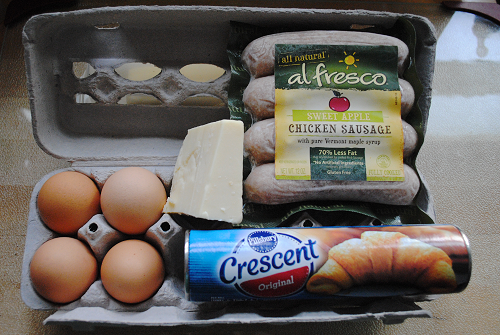 First thing to do is prep the ingredients. 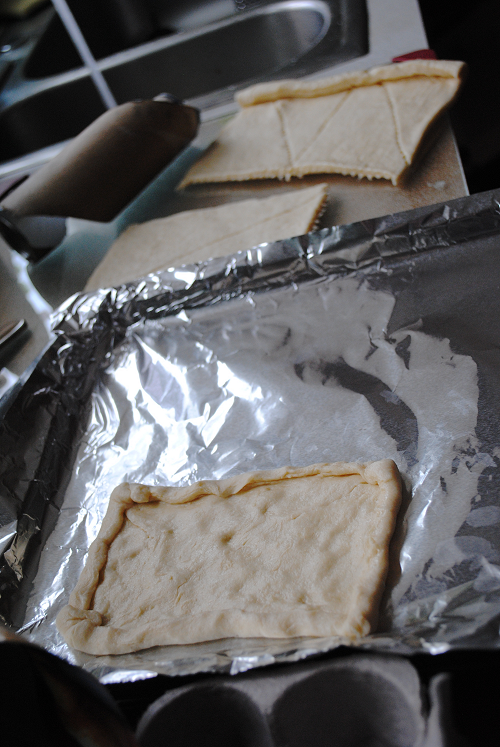 Quarter the dough and press the divides together, sort of kneading it out like pizza, even folding over the edges for a little crust. 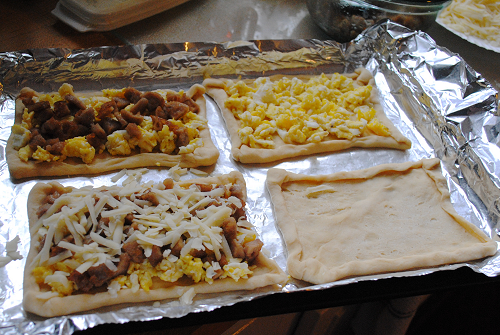 After prepping the dough I fried up the eggs, scrambling them in the pan. Season the eggs how you will, I used salt and pepper. I also shredded the cheddar cheese. 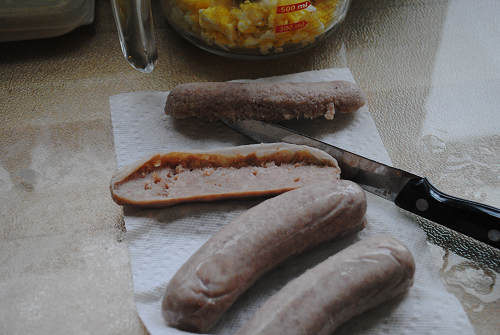 Then I took the casing off the sausage, cus I think the sausage casing makes it yucky. 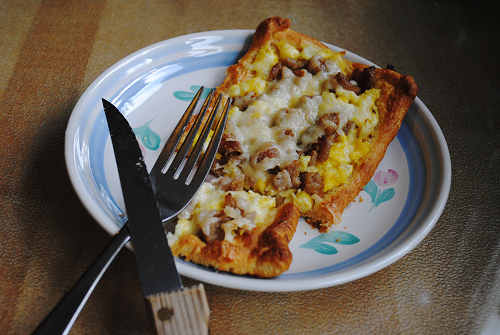 I chopped up the sausage pretty small, fried it up nice and crispy, and set up all the ingredients. 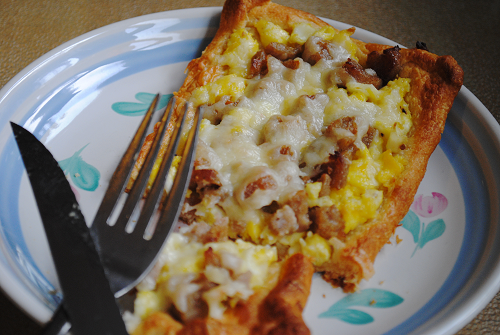 I used a big spoon and put two scoops each of the eggs and sausage on the dough, then topped it with the cheddar cheese. I cooked them all for 12 minutes at 385. I would not suggest cooking on tin foil, I had a brain fart when I was prepping for this project and forgot how awful the dough sticks to it. I will say that I really liked these, there was a good ratio of toppings, although you can always play around with what you’ve got available and add more. I even had the pickiest eater in the house, my little brother, eat one and he said he liked it! 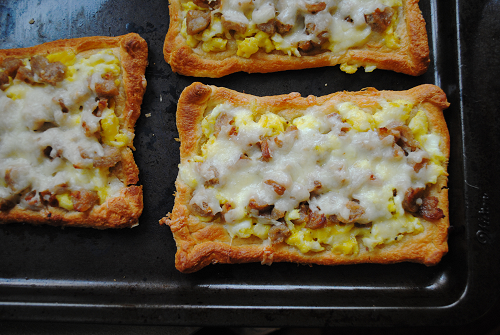 Right out of the oven these breakfast munchies are delicious, but I’m also going to try them reheated in the microwave tomorrow morning.